The 8087 had 45,000 transistors and was manufactured as a 3 μm depletion load HMOS circuit. It worked in tandem with the 8086 or 8088 and introduced about 60 new instructions. Most 8087 assembly mnemonics begin with F, such as FADD, FMUL, FCOM and so on, making them easily distinguishable from 8086 instructions. The binary encodings for all 8087 instructions begin with the bit pattern 11011, decimal 27, the same as the ASCII character ESC although in the higher order bits of a byte; similar instruction prefixes are also sometimes referred to as "escape codes". When the 8088 saw the escape code, it would defer to the 8087 until it was ready. The first three x's are the first three bits of the floating point opcode. Then two m's, then the latter half three bits of the floating point opcode, followed by three r's. The m's and r's specify the addressing mode information. 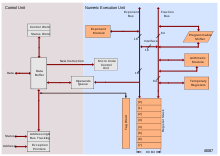 The x87 family does not use a directly addressable register set such as the main registers of the x86 processors; instead, the x87 registers form an eight-level deep stack structure ranging from st0 to st7, where st0 is the top. The x87 instructions operate by pushing, calculating, and popping values on this stack. However, dyadic operations such as FADD, FMUL, FCMP, and so on may either implicitly use the topmost st0 and st1, or it may use st0 together with an explicit memory operand or register; the st0 register may thus be used as an accumulator (i.e. as a combined destination and left operand) and can also be exchanged with any of the eight stack registers using an instruction called FXCH stX (codes D9C8..D9CFh). This makes the x87 stack usable as seven freely addressable registers plus an accumulator. This is especially applicable on superscalar x86 processors (Pentium of 1993 and later) where these exchange instructions are optimized down to a zero clock penalty. The 8087 differed from subsequent Intel coprocessors in that it was directly connected to the address and data buses. The 8088/86 looked for instructions that commenced with the '11011' sequence and relinquished control to the coprocessor. The coprocessor handed control back once the execution of the coprocessor instruction was complete. There was a potential crash problem if the coprocessor instruction failed to decode to one that the coprocessor understood. Intel's later coprocessors did not connect to the buses in the same way, but were handed the instructions by the main processor. This yielded an execution time penalty, but the potential crash problem was avoided because the main processor would ignore the instruction if the coprocessor refused to accept it. The 8087 was able to detect whether it was connected to an 8088 or an 8086 by monitoring the data bus during the reset cycle. The 8087 was, in theory, capable of working concurrently while the 8086/8 processes additional instructions. In practice, there was the potential for a bus crash if both processors attempted to access either bus simultaneously. The assembler would automatically insert an 'FWAIT' instruction after each and every coprocessor opcode forcing the 8086/8 to halt execution until the 8087 signalled that it had finished. This limitation was removed from later designs. Just as the 8088 and 8086 processors were superseded by later parts, so was the 8087 superseded. Other Intel coprocessors were the 80287, 80387, and the 80187. Starting with the 80486, the later Intel processors did not use a separate floating point coprocessor; virtually all included it on the main processor die, with the significant exception of the 80486SX which was a modified 80486DX with the FPU disabled. The 80487 was in fact a full blown i486DX chip with an extra pin. When installed, it disabled the 80486SX CPU. The 80486DX, Pentium, and later processors include floating-point functionality on the CPU core. ↑ Shvets, Gennadiy (8 October 2011). "IBM 8087 floating-point unit". CPU World. Retrieved 1 December 2011. 1 2 Shvets, Gennadiy (8 October 2011). "AMD 8087 floating-point unit". CPU World. Retrieved 1 December 2011. 1 2 Shvets, Gennadiy (8 October 2011). "Cyrix 8087 floating-point unit". CPU World. Retrieved 1 December 2011. 1 2 "8087". Coprocessor Dot Info. 2007. Retrieved 1 December 2011. 1 2 3 "Intel FPU". cpu-collection.de. 2011. Retrieved 1 December 2011. ↑ Sanchez & Canton 2007, p. 96. 1 2 3 Shvets, Gennadiy (8 October 2011). "Intel 8087 family". CPU World. Retrieved 1 December 2011. ↑ Sanchez & Canton 2007, p. 110. ↑ Frolov, Sergej (10 October 2006). "USSR-made i8087 clone". CPU World. Retrieved 1 December 2011.